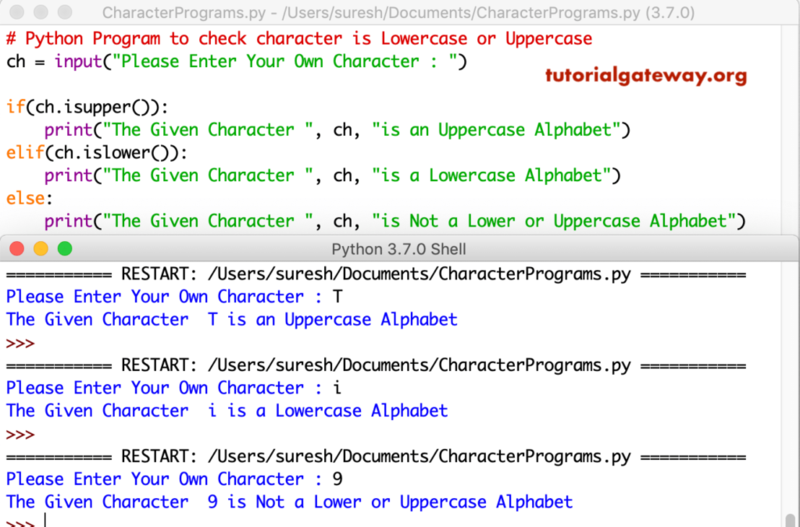 In this article we will show you, How to write a Python program to check character is Lowercase or Uppercase with practical example. In this program, we are using a built-in string functions called islower, and isupper to check whether a given character is lowercase or uppercase. This python program allows a user to enter any character. Next, we are using Elif Statement to check whether the user given character is lowercase or uppercase. Here, If statement check whether the character is greater than or equal to small a, and less than or equal to z. If it is TRUE, it is an uppercase otherwise, it will enter into elif statement. Inside the Elif, we are checking whether the given character is greater than or equal to A, and less than or equal to Z. If it is True, its is a lowercase character otherwise, it is not a lower or uppercase Alphabet. In this program, we are using ASCII Values to check the character is uppercase or lowercase.